Join us for the a PRIDE NIGHT flash back to the 60’s and 70’s! Party people ages 13 – 20 are encuoraged to wear tie-dye, bell bottoms, platform shoes, and flashy disco outfits! 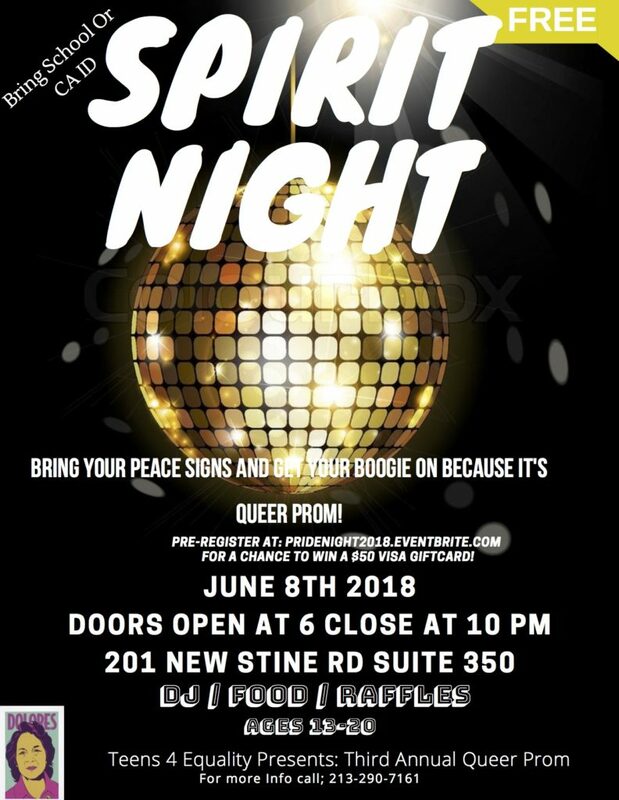 Pre-Register at PrideNight2018.eventbrite.com for a chance to win a $50 gift card. Must be present to win! Please bring your school or CA ID. Doors open at 6pm. Dance and celebrate until 10pm! The Dolores Huerta Foundation, with support from the Center for Sexuality and Gender Diversity, are hosting this event toprovide a safe space for young LGBTQ people to be themselves and express their individuality. Food and drinks will be provided free of charge! Last year’s Prom was a great success and we expect this one to be even bigger and better!